What madness lies in the heart of your neighborhood? Looking for something new and scary to play that's appropriate for Halloween? 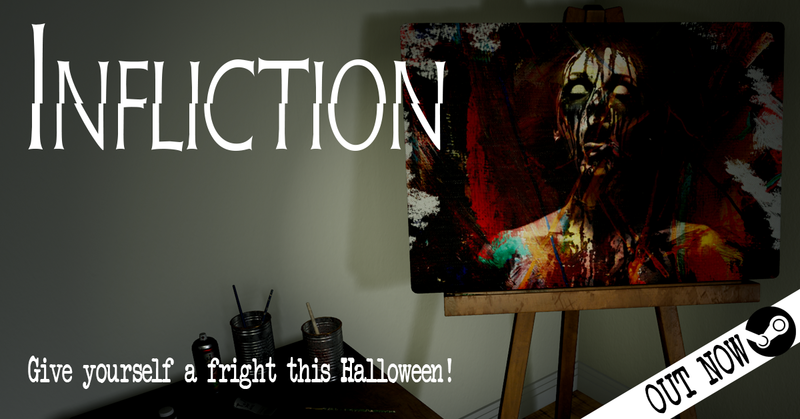 Give Caustic Reality's newly-launched Infliction a try, which looks like an impressive release all from one man – Clinton McCleary. McCleary tackled the game as a solo project, and acted as designer, programmer, artist, animator, and sound engineer. He's been busy, and the game looks particularly creepy. Infliction is a first-person psychological horror title that looks to explore the madness of suburbia. Players are tasked with exploring the nightmarish world of an average family home and piecing together parts of the story from letters, journals, messages, and other tidbits found within the home. The dark secrets of the home will be revealed in time, all while a shadowy creature stalks you from the darkness. Inspired by games like Gone Home, creator McCleary states that it's focused on creating "personal tension" and is inspired by fears that came about when he became a father for the first time. With that in mind, you can bet it'll be teeming with some very spooky moments. The game's available now on Steam if you're curious about what horrors it holds. This one’s been floating around for a while, so it’s nice it came out. It didn’t look overly original, from the footage I saw, but it was working the scary mood/sfx/lights suddenly going out etc. The only horror game out so far this year that looks genuinely twisted and also quite polished is Remothered.